PHII's Online Manufactured Homes Course is 16 hours. Also referred to as mobile homes, manufactured homes are one of the fastest growing home inspection markets in the country. This course teaches you how to perform an inspection on a manufactured home and how to write an inspection report that properly addresses its components and systems. PHII offers the only course that includes manufactured housing report forms. Mobile/manufactured housing must be inspected differently than traditional site-built housing because they are built to HUD regulations which affects the design and construction methods. 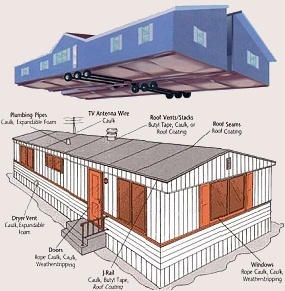 Some important points include the non-removable chasis, bracing and support systems, the 4-wire electrical service common to all manufactured homes, polybutylene supply piping, wind/load/thermal zone ratings, metal roofing, skirting, under wrap, and potentially hazardous aluminum wiring. You will learn to distinguish manufactured homes that use higher quality construction materials from those that use lower quality materials. The course will teach you the different construction methods and how to recognize them. You will also learn about the HUD Manufactured Home Construction & Safety Standards, and the regulations for electrical, gas, water and sewer hookups. As you complete each lesson, you will use interactive flash cards and take practice quizzes that will test your knowledge, generate instant feedback and provide opportunities to correct mistakes, re-learn information and re-test. Our system keeps track of your progress, so you can take a break at any time, even turn off your computer and the course will return to where you left off. When you finish the course and pass the final exam, you will possess the knowledge and skills needed to inspect manufactured homes. Online Course Access and optional back-up CD, Online Flashcards & Testing, Manufactured Home Inspection Report Addendum Forms, Certificate of Completion, Toll Free Student Support.